Talk about bang for the buck: full Shimano drivetrain, the versatile NCX fork with lockout, and sturdy disc brakes, all at an extremely reasonable price. And just like its big brother, the Trail 1.0 gets Schwalbe Tyrago tires this year, giving you the perfect mix of smooth rolling tread and traction grabbing knobs, and Kevlar reinforcement. We revamped the 2014 Misceo line for improved handling and comfort. We managed to achieve this by simply lowering the bottom bracket. The result was an overall lower center of gravity which increases the standover clearance, improves stability and produces a more confident ride. For additional rider comfort, this year we’ve introduced the Raleigh Sizing System that is based on an exhaustive database of bike fittings. This system is used during the development of new geometries allowing both customers and sales staff to determine the best size for the rider quickly by referencing a size decal on the bike. 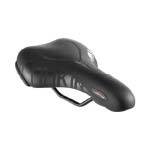 The majority of the Misceo models feature the new Lookin saddles from Selle Royal. These saddles feature Royalgel, a proprietary ingredient that has been shown to reduce contact pressure by up to 40% providing the maximum level of comfort through better weight distribution.These saddles are also made with Strengtex, an extremely durable material that is able to repel scratches, tears and water.The Lookin is as visually striking as it is technical, boasting a transparent "window" to its Royalgel interior. We revamped the 2014 Misceo lines for improved handling and comfort. We managed to achieve this by simply lowering the bottom bracket. The result was an overall lower center of gravity which increases the standover clearance, improves stability and produces a more confident ride. For additional rider comfort, this year we’ve introduced the Raleigh Sizing System that is based on an exhaustive database of bike fittings. This system is used during the development of new geometries allowing both customers and sales staff to determine the best size for the rider quickly by referencing a size decal on the bike.